If you’re looking to purchase a hard drive and want to know which ones have the best track record, it would be harder to find a better source of information than the annual report from Backblaze. Backblaze is a cloud storage provider that uses exclusively off-the-shelf commodity hard drives in it’s datacenter. They maintained detailed statistics on how well various drives performed and, in 2013, they began analyzing that data and making it available to the public. 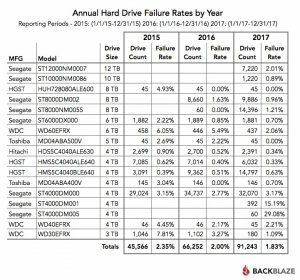 Since then, the annual Backblaze Drive Stats report has been an authoratative source of data on which drives to buy (and which to avoid).